The problem with the iPad is that it is next to useless whilst "away". It is so tied to wi-fi and the "Cloud" that it is almost impossible to get files on it, or off it again. Out of the home it is basically a toy, so bear that in mind. I have Affinity on all platforms, but use the iPad most of all. Yes I use iCloud because it works. Only other support app i would recommend is Documents by Readle for unzipping brushes etc. You wont regret it but will agree if you think PC then it will take some adjustment to move to iPad. Check out the idrive range. Lightning to USB 3. IPad Pro range utilises USB 3 transfer rate. Check out the idrive ﻿range. Lightning to USB 3.﻿ IPad Pro range utilises USB 3 transfer rate. Unless someone knows a better way? 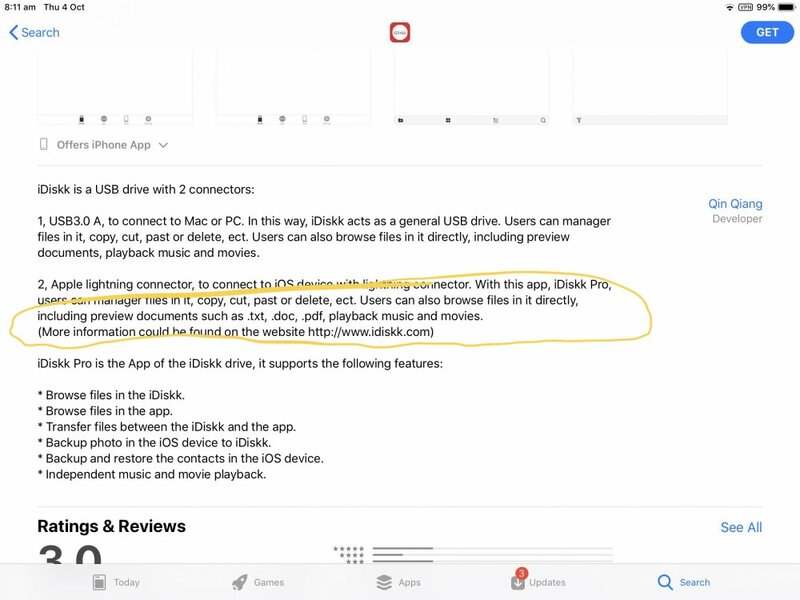 The idrives that come with their own app are able to access Files. You could also try https://www.easeus.com/phone-transfer/mobimover-free.html There are many similar windows/Mac programs that allow you to access data on the iPad. Yes, but what happens if you are away from home without a wi-fi connection? A situation I find myself in quite a lot. That Apple tech becomes a paperweight. OK, thanks, I'll have a look. But why could Apple not build this in? Every single Android device can connect to a PC using a simple USB cable. Files I am working on are on the iPad and get synchronized when wi-fi is available. I only move them out once I have finished with them. I recently spent a week away from home with no wi-fi. If I had needed access to my files it would have been impossible on an expensive iPad, but a piece of cake on any cheap Android device. If I need more Android storage, I can stick in a cheap memory card. OK, there are ways around it but the aggravation is something the OP should consider if he is thinking of using an iPad. A cheap PC laptop and a full version of Affinity is 10 times better. I have a small Acer Cloudbook with a full version of Photo on it and it beats the iPad hands down. You don't need a wifi network. I take a WD Wireless Pro HDD which connects wirelessly to the iPad and provides a very fast data transfer over its wireless AC connection (5GHz). A 40MB File transferred into my Lumafusion app is 4 secs. The HDD has 2TB storage (in addition to the iPads 1/2 TB). I can already add extra storage with a lightning /USB3 stick and just plug straight into the iPad for direct file transfers. Yes, Android has a USB connector but it is more the 'sandboxing' in iOS that introduces the file access 'issues', but also insures greater security. I've tried android devices and found them wanting. The added security of iOS and the smooth operation of the iPad makes it a no brainer for me. I prefer a proper (if small) laptop with a mouse. Especially the mouse. The Cloudbook I use has a SSD and battery life is about 10-12 hours, I also have a spare battery so can double that, if needed. There is no need for any external storage although I do carry a 2tb external USB drive. It is so much more productive with a mouse than tapping away with a finger and it is easy to connect directly to my 27" monitor using HDMI when I get home. Even whilst out, sometimes. I can also connect my camera using direct USB or a card reader. Compared to all that, the iPad seems like a toy. To be fair, the only accessory you listed that can't be used with an iPad is the 'mouse', and for that I find the Apple Pencil to be an adequate alternative. For professional use I'd probably prefer a Mac of some sort. Still if the iPad is a toy, I’d argue that it is a pretty powerful one and lots of fun to play with! I really need a keyboard too, I am a 'hardened' shortcut user and the first thing I do is create (or load) a fairly wide set of keyboard shortcuts. A proper mouse and keyboard shortcuts dramatically increase productivity. I do play with the iPad but if I need to actually do anything, I want a proper PC. Bear in mind too that the iPad lacks proper colour calibration, AFAIK. So any adjustments you make are unlikely to be valid anywhere else. Out of curiosity, what do you actually do on your iPad? I don't find it useful at all, but I do use it for browsing and a bit of 'play'. Which is fun, but it is a very expensive toy. I understand that David Hockney creates art on an iPad, which is one 'real' use. Don't know what software he uses. Maybe my opinion is biased by too many years of professional editing. I always think in terms of improving productivity and bigger and better monitors, and where's the fun in that? Treat yourself to a Bluetooth keyboard. Anker offers a nice range. I bought one based on your earlier recommendation (thanks) and it does help. However, I have a load of custom shortcuts that I use all the time and the iPad does not support them. I also have wireless portable/rechargeable hard drive that I use to backup my camera SD cards when I travel. Its has its own wifi and it could be used as a portable HD for your documents. A Lightning SD card reader could also be used. Its cheaper and a lot more portable. Earlier this summer, I moved my entire content-creation "empire" from my MacBook Pro to my iPad Pro 12.9" (with Apple Pencil and Bluetooth keyboard). It was the best move ever. I make YouTube videos on the fly - videos shot using FilmicPro... videos edited in Luma Fusion... thumbnails shot with Halide... voiceover recording in Ferrite Recoding Studio... popup graphics using Affinity Designer... video script created on SimpleMind (mind mapping app). My "toy" makes me a full-time income. I have been waiting for this moment for a LONG LONG time. And later this year, I will install a NAS file drive into my home router/internet connection - allowing me to backup/sync files from anywhere in the world. For when I am not online, I will use Western Digital's Wifi external storage. The only complaint I have about the iPad Pro is copy/paste. I do wish Apple would fix that problem. It is still dicey. This setup I have is FAR cheaper (and better) than any laptop/desktop alternative. So this is not an expensive toy for me. I remain in awe of how amazing my iPad Pro setup is. My dream has come true. It is not likely to lure me away from a 'proper' laptop but I haven't bought myself any toys lately, and it does sound useful. Same here. The main thing stopping my laptop from getting really dusty at the moment is the Affinity Publisher beta test. The one I have is the Western Digital My Passport, it has a rechargeable battery, a USB 3 port, and a slot for SD cards. When I'm away and take a lot of photos I just insert the SD card in it and it backs up my card automatically. I backed up my SD card every day for a month and I never had to charge it. It has its own wifi network that you can access with your computer or tablet. I have the 2 TB version. It's cheap, very portable and useful. @AlainP is that the Wireless Pro version with both 2.4 and 5ghz wireless access point? The latest model has SSD but I find the 2TB HDD works well for me (and more avoidable in retirement). The last firmware update also appears to have addressed the earlier issues with so card backups failing. When travelling it is great being able to connect directly to the WD's 5ghz access point and get access to all my photo archives. @toltec I used Microsft Office Word and PowerPoint, Photoshop, Premiere Pro, Acrobat Pro and InDesign to produce training videos and learning manuals. I often shot video on a camcorder but would occasionally outsource the filming. I agree with Marcus in that the iPad Pro makes it possible to do all this without dragging around a laptop onsite. With apps like Pages, Keynote, Filmic Pro, Luma Fusion, Affinity Photo, PDF Expert and (hopefully soon on the iPad) Affinity Publisher, I could actually have produced those materials solely with the use of an iPad and backed them up to my WD Wireless Pro without returning to the office. I'm assuming here that Publisher will allow document output suitable for commercial print company.